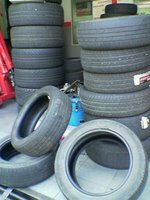 It is not safe to drive around with tires that have already worn out. To think that I was crazy enough to drive around town with tires that has minimal treads, I even took a trip with passengers on a trip outstation to Segamat to attend a friend’s wedding. Thank goodness for God’s protection nothing untoward has happen. The trip went along quite smoothly. It was a 3 hour drive there and a 3 hour drive back. Left me pretty much tired the next day. Age must be catching up on me or perhaps my physique and mental stamina has not been that good anyway since any long distance driving always makes me rather tired. Long distance driving always makes me sleepy. Especially on long drive on a beautifully constructed two-lane highway. Small talk in the car helps to alleviate the sleepiness but sometimes we run out of topic and it is good to have silence once in while. But it is not good if non-activity dulls the brain and cause sleepiness. Coupled with the early wake up of around 5am in the early morning and the many long hours of driving. That’s it! I’ll be dead tired the next day. For the technically minded, 195 means the width of the base tire, 55 is the distance from the tire base to the rim, while 16 means the diameter of the rim. The 87V is some code denoting the top speed the tire can run for specified time period. At first, I checked with the tire manufacturer, since I know a friend there who could give me staff rate which is well below market price. I could do with some savings, but unfortunately they do not have the model and stock available for this size. Strange! No choice but to go to the car dealer. There is a nearby shop just down the block from my office. Very convenient, so I took my car there. Well it seems I have no choice, as the price of tires especially for my car model the Toyota Altiss has limited model to choose from. Prices range about RM300+ a piece. Which is quite a big difference if I could get the tire direct from the factory there would have been a savings of about 30%. Well no choice now. I must change the tires or risk getting into an accident. The dealer paraded two models, Goodyear and Yokohama tires. I have tried Goodyear tires which are made in Malaysia, but I never quite like them because they tend to be noisy. I am not too familiar with Yokohama tires as I have not used them before; it seems it is made in Philippines. Since my car was already using the Bridgestone tires, I may as well stick back to this model. When I bought the Toyota Altiss, it came with the Bridgestone tires, and so far I have no problem using it. The Bridgestone tires are made in Thailand; I guess my car being manufactured in Thailand would be supplied with tires made from there too. Phew! The bill is quite high, but I guess maintaining a car is not cheap! Just too bad that the Malaysian public transport is not that great, and it is still more convenient to move around with a car. The public transport does not cover all the locations and in any case, moving from one place to another requires many changes of bus or train stations. The efficiency also drops during the rush hour and everybody crams into the buses because nobody would like to wait for the next bus which who knows when it might come! That’s why so many people still buys a car if they can afford it, but the way the price of cars goes up (not to mention the price of fuel too) it is no more a luxury but still very much a necessity to own a car. So small compact cars become more popular and I can see more of it on the road everyday. They are good for town driving but not so good for long distance driving. Still I can see some driving up the steep winding road all the way up to Genting Highlands! Tags: car maintenance, cars, toyota.